WEST LAMPETER TWP. 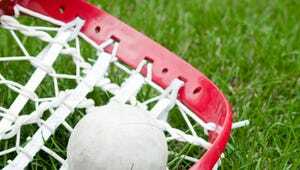 - Red Lion lacrosse had Thursday's season opener circled on its calendar for months. A matchup that pitted one of the YAIAA's best teams, Red Lion, against one of the L-L's best, Lampeter-Strasburg, provided the Lions a chance to make a statement on behalf of the York area. For years, L-L teams have been a step or two ahead of the YAIAA. And on Thursday, the L-L flexed its muscles again as the Pioneers used seven fourth-quarter goals to pull away from Red Lion, 16-10. Still, the Lions didn't come back from their trip across the river empty-handed. There were lessons to be learned from playing such tough competition, coach Stefan Striffler said. Lesson No. 1: York has talent, but the L-L teams are very good. "This is the same lesson we learned last year when we lost to Wilson in districts, and it's that we're talented, but you have to play smart," Striffler said. "We don't see this type of competition enough. They're talented and they're skilled and they're smart. Hopefully by playing them more, we're starting to learn. We're good. But we have to play smarter." Red Lion senior Jac Gemmill added, "They (Lampeter-Strasburg) know how to move the ball better. They're just different. They know how to really run an offense." Lesson No. 2: Winning faceoffs is crucial. The Pioneers, who outshot Red Lion 40-22, won 16 of 24 faceoffs, including four in a row in the first that led to four straight L-S goals after Gemmill had given Red Lion an early 2-0 lead. "I don't know if our guys got a single clamp on them during the faceoffs," Striffler admitted. "They (L-S) had to win 95 percent of them. That was the game. We're a quality team that can hang with a quality L-L opponent but we couldn't get a faceoff." When Red Lion had possession, it found ways to score, evidenced by the Lions erasing three-goal deficits twice in the second and third quarters. "We put up 10 points so I think our offense was good," Gemmill said. "Mason (Gauntt) is a good faceoff guy, but theirs was a little better. We can't rely on Mason to get us the ball every time." Gemmill finished with two goals and five assists. Four of those assists were to Justin Dashler, including one in the fourth that cut the lead to 11-9 with 4:29 to go. But the Pioneers reeled off five straight goals in the final three-plus minutes to pull away. Red Lion's Matt Hale made his first varsity start in place of Nick Serrano, who tore his ACL in the offseason, and made 14 saves. "I think he did fine," Striffler said of Hale. "When he found out Nick was injured, he really dedicated himself and he did fine today. ... Overall, we hustled and we got groundballs. And when we did get the ball on offense, we seemed to be able to get some good shots. But they're a quality opponent."